The cornerstone for Our Lady of Victory, a little French Church in downtown Rochester, NY was laid in 1868. This new church was to serve a young and growing local Francophone community including devout French, Belgian and Flemish immigrant families. 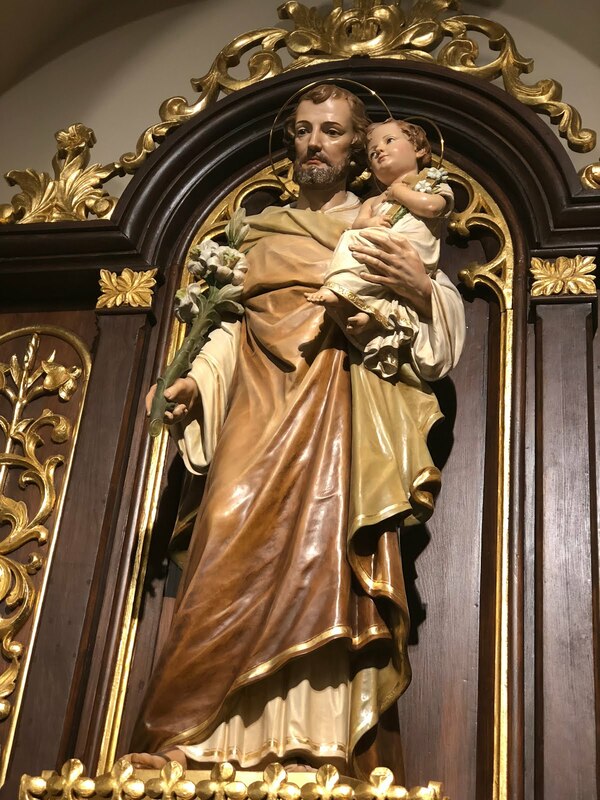 From the outset, one of the most notable and precious possessions of the parish was a mid-19th century Marian statue, a polychrome copy of the marble carving enshrined in the Basilica of Notre Dame des Victoires in Paris, transported from France by one of its most energetic and gifted pastors, Msgr. Hippolyte De Regge. The Rochester firm Andrew J. Warner & Co. designed the church building. The edifice is a characteristic 19th century work – an imaginative and eclectic composition with neo-romanesque, richardsonian, Victorian, carpenter gothic and federal style elements. The interior of the new church consisted of a single nave with a semicircular apse flanked by two recessed arches. The high altar and two side altarpieces were inaugurated in 1871. All three were designed and built by Benedict C. Further, a mechanic, with carvings by local artisan, a Mr. Bleuel. Msgr. De Regge was a mastermind behind the initiative. In the 1880’s, new mural work carried out by a gifted local artist Leon Lempert was introduced in the apse. Later, a round skylight was opened above the altar and a Lourdes grotto was built in one of the side shrines. Fr. Alphonse Notebaert, another priest under whose leadership the parish thrived, was responsible for these additional modifications. Under the impressive and tireless efforts of Msgr. De Regge and Fr. Notebaert the parish of Our Lady of Victory underwent its greatest and swiftest development. However, the subsequent shifts in local demographics and troubled economy coupled with destabilizing changes to the interior proved more and more detrimental to the parish, as the years went by. In 1974, St. Joseph church, located only a short walking distance away, burned down. The two parishes were merged. A large icon of Our Lady of Perpetual Help which was miraculously untouched by the fire was installed in its new home - Our Lady of Victory-St. Joseph Church. 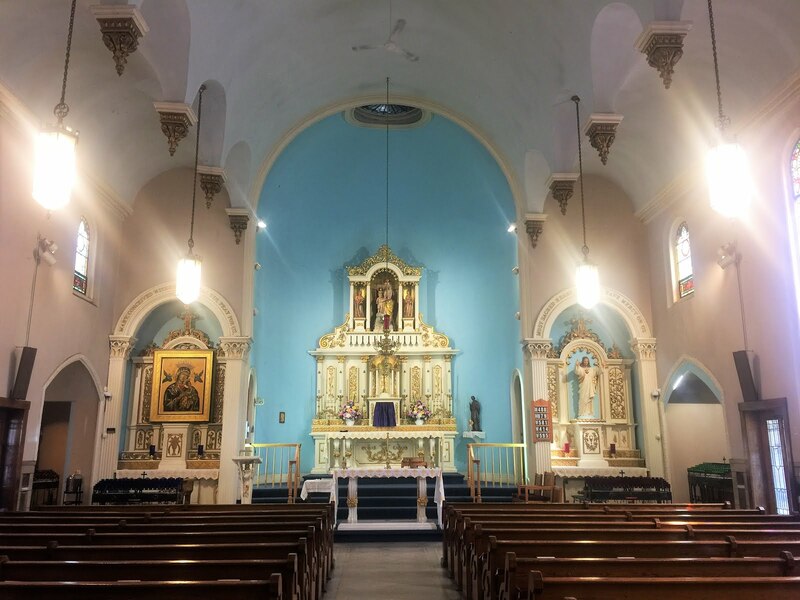 At one point on the brink of permanent closure and without a pastor, now restored Our Lady of Victory-St. Joseph Church overcame numerous challenges, including several unfortunate renovations in the 20th century. The little French Church emerged this year, which marks its 150th Anniversary, not only unscathed by the past turmoil but significantly revived. In 2017, Rev. 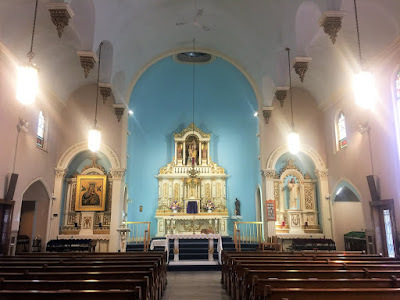 Ronal Antinarelli, current pastor, and his stalwart Renovation Team tapped Granda, Spanish liturgical arts workshop, to oversee the artistic overhaul of the interior – joining meticulous restoration of antique artworks with the much needed addition of new liturgical furnishings and apse paintings. The renovation process began with the analysis of samples taken from the walls, wooden altarpieces, and statues. The next step was a thorough study of all extant literature documenting changes to the sanctuary and the interior since the 1860’s. Laboratory results confirmed that all previous mural work in the sanctuary had been irrevocably lost but that the walnut altarpieces, several statues, an icon, Via Crucis, and a baptismal font could be restored. 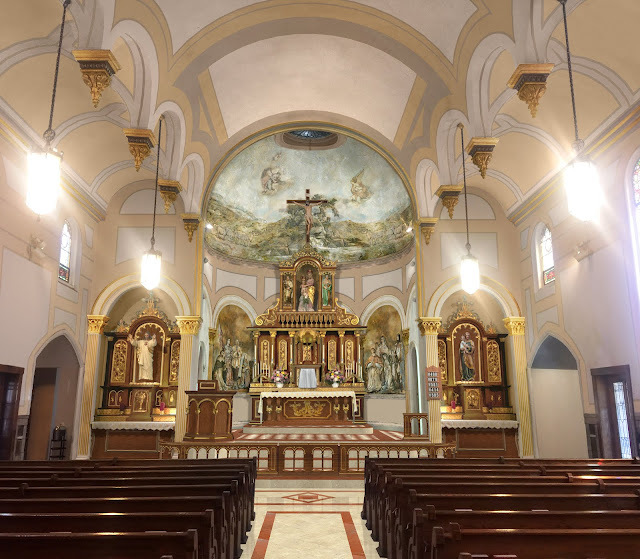 Based on historic photographs of the church, Granda introduced a decorative renovation program that was deeply informed by the original aesthetic plans for the building. 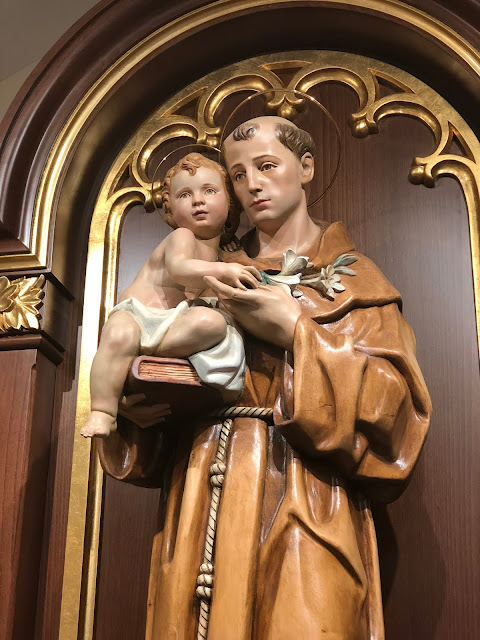 The new additions include a pulpit, communion rail, restructured sanctuary platform, chairs for the celebrant and servers, statue of St. Anthony with its own shrine, new relief for the baptistery, new confessionals, and a stained-glass window to crown the apse. The mural program in the apse is also new. Figures of eight saints in prayer are painted on both sides of the high altar. 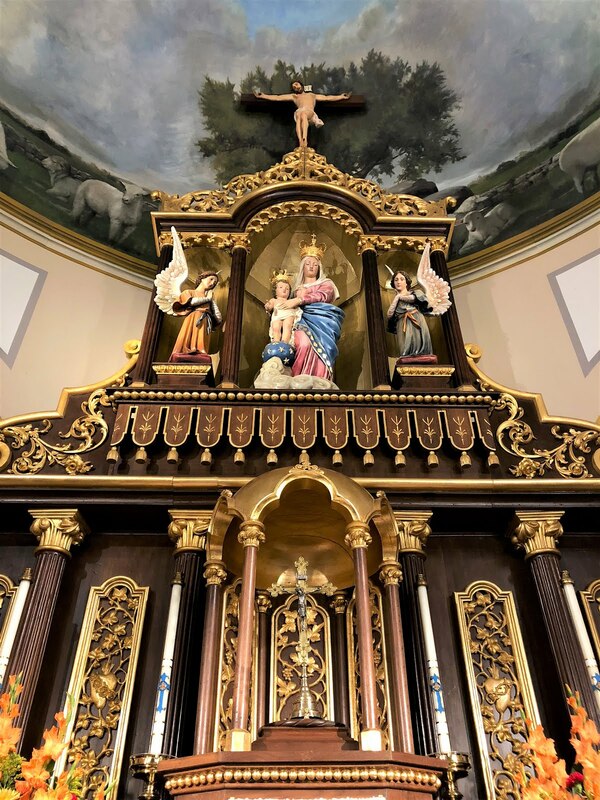 While each saint is shown in a different posture and with attributes specific to their Christian iconography, the quartette groupings are united by manifest attention and devotion to the altar and the tabernacle. 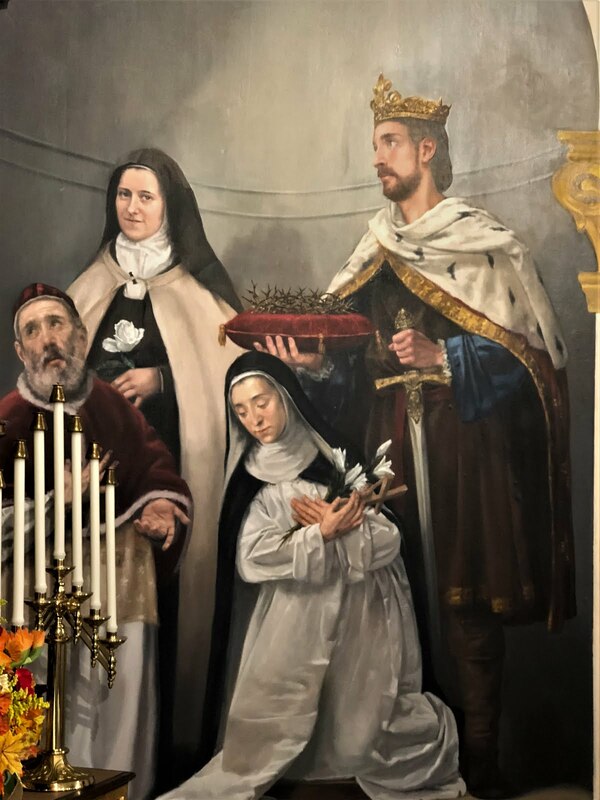 On the left side of the altar: St. Dominic, St. Joan of Arc, Pope Pius IX, and St. Bernadette. On the right side of the altar: St. Therese of Lisieux, St. Catherine of Siena, St. Luis of France, and Pope Pius V.
In the half dome, the image is an open field with a centrally planted tree that also serves as a background to the Crucifix. Six sheep on each side of the tree are a visual reference to the Tribes of Israel and the Apostles, as well as the beloved parables of Jesus about the Shepherd and the sheep. 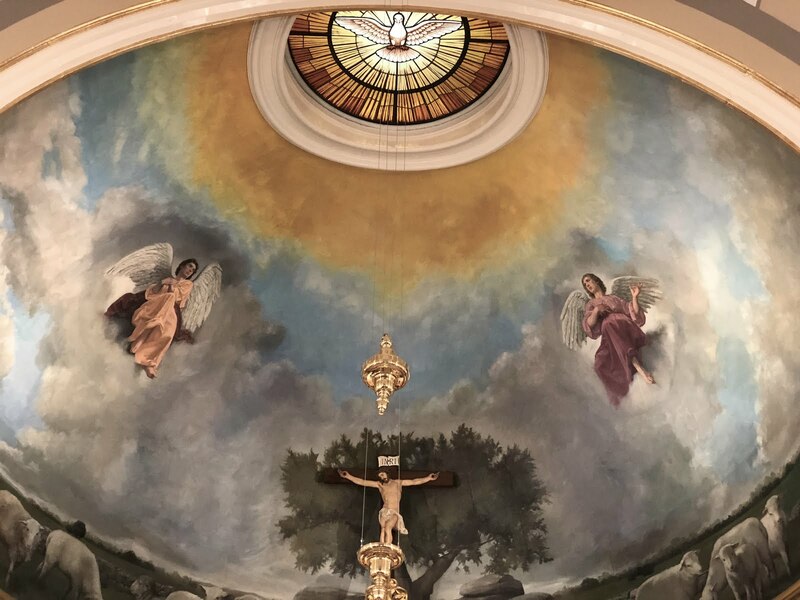 Two adoring angels hover in the half dome, mediating space between the Holy Spirit stained glass window and the Crucifix. 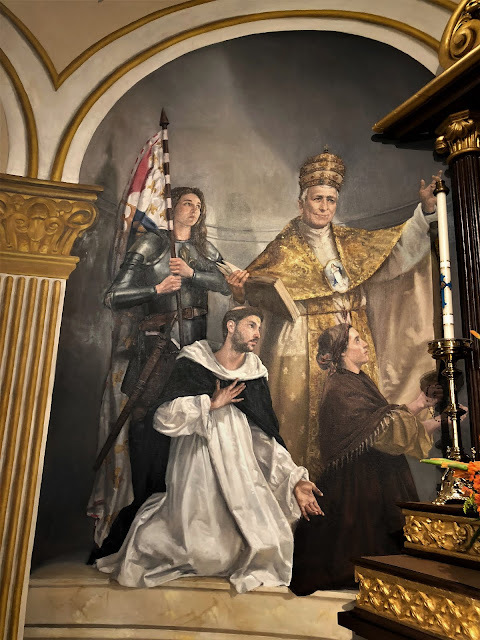 Restoration of all antique artworks, including the altarpieces, the antique statue of Our Lady of Victory, the miraculous icon of Our Lady of Perpetual Help, and a set of canvas painted Via Crucis was carried out in Granda’s workshop in Alcala de Henares, Spain. All new art and the paintings were also completed in Spain. 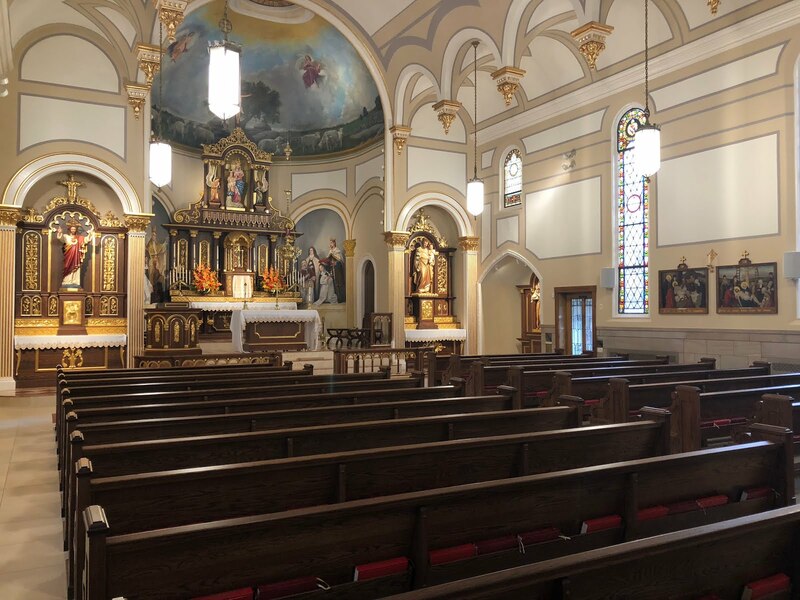 This extensive renovation was generously underwritten by a Rochester family who reached out to the pastor when he announced to the congregation that he prays for but has no means to restore even some of the beauty intended for the interior of the church. Rev. Ronald Antinarelli has served as the administrator and then pastor of Our Lady of Victory Church for well over a decade when he has made that announcement. Unintimidated by the increasing challenge of the inner-city location of the church nor deficit of means, Fr. 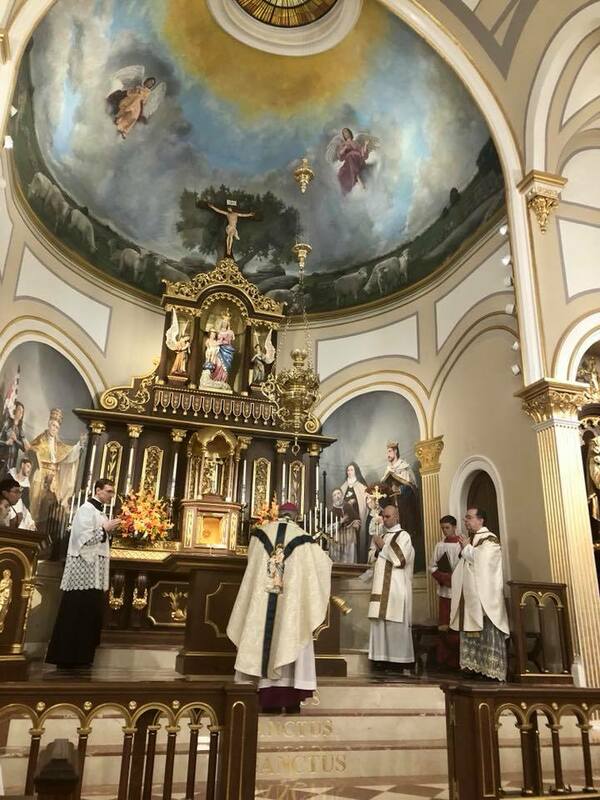 Antinarelli carried a solid and consistent liturgical life and artistic revival of Our Lady of Victory parish one small step at a time with the unexpected grand finale rapidly maturing over the past 18 months. Bishop Matano of Rochester, wearing the newly restored heirloom vestment with the hand-embroidered image of Our Lady of Victory, dedicated the high altar and blessed the renovated interior during solemn Mass on October 7, 2018. The historic statue of Our Lady of Victory was formally enshrined and crowned during a separate, earlier ceremony. 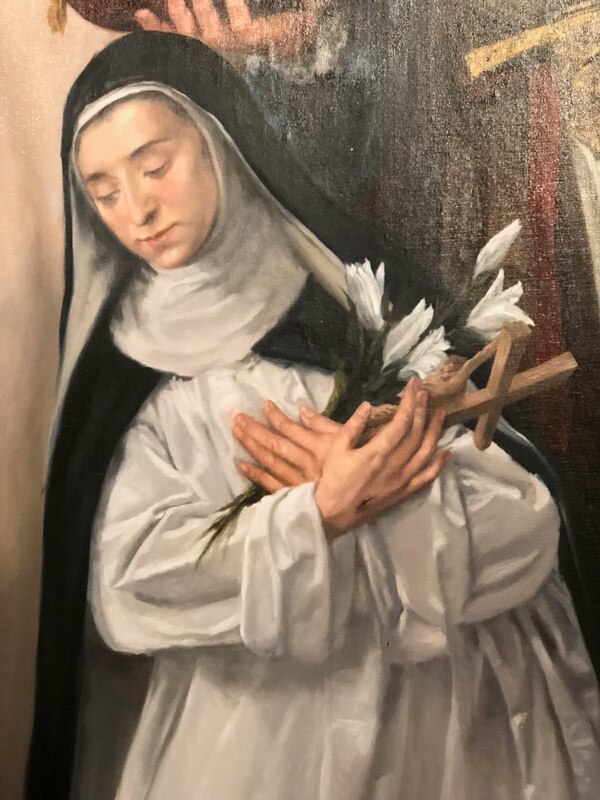 Art Dealer & Project Consultant working with new liturgical art commissions, renovation planning and heritage restoration.